Following a turbulent last few months, Virginia Gov. 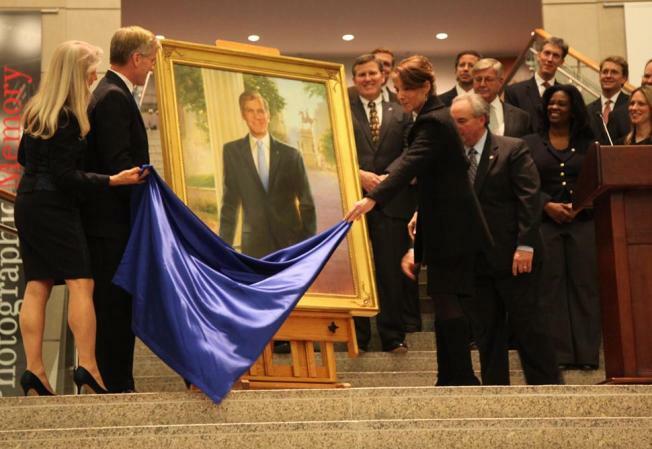 Bob McDonnell (R) attended the unveiling of his official gubernatorial portrait Tuesday evening. The portrait will be displayed on the third floor of the Virginia State Capitol, along with those of McDonnell's predecessors. The portrait was painted by Nancy Mauck of Richmond, who painted Tim Kaine's gubernatorial portrait several years ago. McDonnell has largely stayed away from the spotlight, especially during this year's gubernatorial race. The last months of his term as governor have been marred by a scandal surrounding his relationship with former Star Scientific CEO Jonnie Williams.